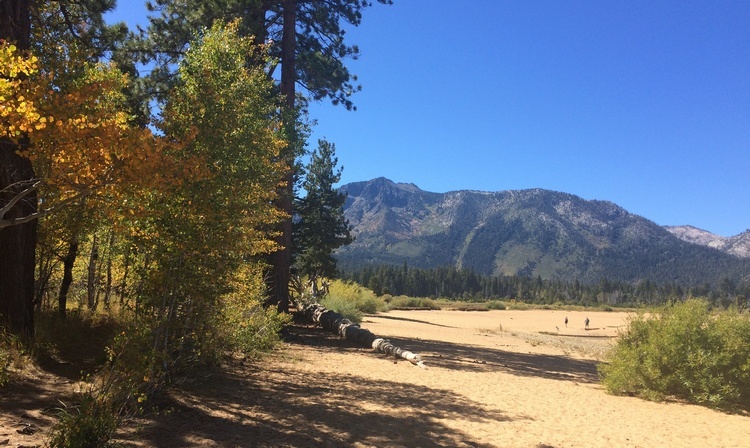 What to expect when planning a trip to Lake Tahoe in the fall? It’s a tough question, because there’s so much going on with music, festivals and weather. The weather in September had it all: it rained, hailed, snowed, and the capper was a tornado warning on the Lake and a water spout that developed on the water near Zephyr Cove. The warm and sunny days of August waved bye-bye, and suddenly it was autumn in the Sierra Nevada. Which is just part of the fun up here in the mountains: it’s a day to day adventure, but why not embrace and enjoy it? The weather cools in October, but not to the point of starting to hunker down for the long winter. I like to think of it as the hiking month around the Carson Range in the Tahoe basin. The Van Sickle Bi-State Park at Stateline, behind the casinos and the Heavenly Village, is a great place for a day hike, and it accommodates all types of outdoor enthusiasts. Whether you want to go for a trek on the Tahoe Rim Trail, bring your horse, or just go high enough to see a peekaboo view of the Lake, this park can cover it. The fall foliage is also quite brilliant on these Van Sickle trails as well, and there is wildlife everywhere. 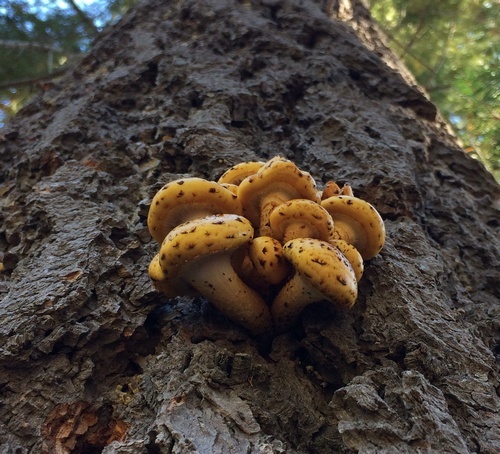 Chipmunks, bears, hawks, and even the mushrooms are interesting, growing all over the place. And the park is right in the middle of the tourist center of South Lake Tahoe. The Kokanee Salmon also find October to be of particular interest. During the month, they head to Taylor Creek, a tributary in South Lake Tahoe, to spawn, and people enjoyed it so much they created the Fall Fish Festival to watch and support the fish on their quest to perpetuate their species. 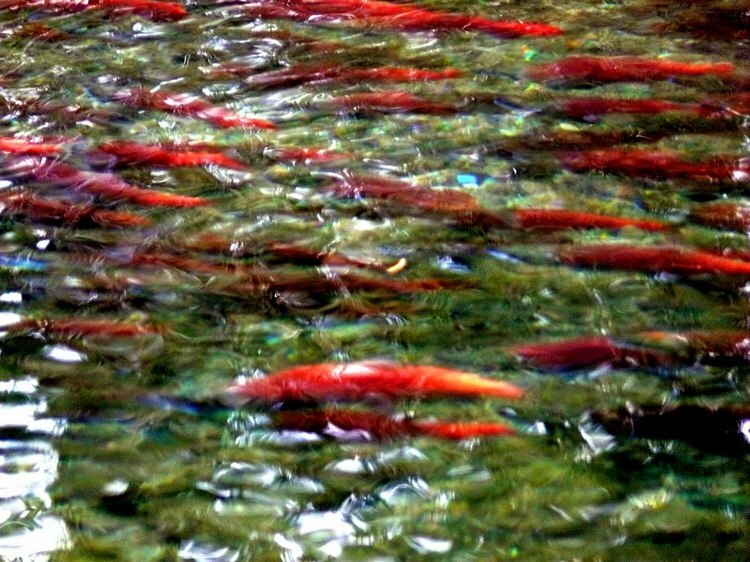 Come celebrate the annual fall migration of the Kokanee on Saturday and Sunday October 7 and 8 at the Taylor Creek Visitor Center off Highway 89 in California. Then, on the same weekend and while the fish are doing their thing, right down the road at Camp Richardson Resort is Oktoberfest, now in its 23rd year of celebrating all things German. Good food, good brews and most likely good people. Festivals abound in October at Lake Tahoe, and to conclude the month Harrah’s will have its eighth annual South Lake Tahoe Food and Wine Festival October 27-29. The Grand Market Expo on Saturday will feature sumptuous dishes from chefs at Harrah’s and Harveys, along with wines from vineyards all up and down California. The weekend will include a wonderful trumpeter, Chris Botti, on October 28 in the South Shore Room — a very relaxing way to end a day of eating and drinking. The natural phenomena up here at the Lake are enough for anybody to come up and witness for themselves, but the added man-made entertainment is the kicker to nature’s jackpot.